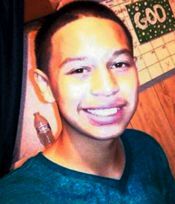 HOUSTON– (Oct. 17 2014) – Three suspects charged with the death of Aldine’s Stovall Middle School former student, Jose Luis Meraz, have been arrested, Houston police reported. Jose Granados-Guevara, 22, and William Alexander Valladares, 17, are charged with murder and both are being held without bond. A third suspect, a 14-year-old male, is being referred to Harris County Juvenile Probation Department authorities on a murder charge. Meraz body was found near the Addicks Reservoir in West Houston in the evening of Sept. 15th. The body was in the woods near Sherwood Forest Road, discovered by a man out walking a dog. The medical examiner reported that Meraz died of blunt force injuries and multiple sharp force injuries, most likely by a machete, according to police. The case was referred to the department’s gang division. There were no known witnesses or suspects in the case but further investigation led to the identities of Granados-Guevara, Valladares and a juvenile male as suspects in this case. All three were taken into custody last Thursday, October 16, and subsequently charged in this incident. Meraz was 14 years old, and from Honduras, living with his aunt because his parents had been deported back home about a year ago. According to family members, Meraz had made a change in his life and was attending church close to his aunt’s house after hanging with the wrong people. His body was flown to his native Honduras where his parents live. The investigation is ongoing with additional arrests possible, police reported.